Excellent place. Loved the helpful staff who took time to welcome me and help me plan few days in Barcelona, provided tons of useful information. I also liked the apartment which was clean, shower had good pressure of hot water and bed was comfortable. Location is great for a start of a good walk around the city. Kitchen has all the stuff you would expect. Will be back here again. Room was beautifully finished equipped. Bed was very comfortable and I really enjoyed the location since it was so close to the main Metro terminal. The owner was very helpful in giving us directions on how to see all the sites. I just wished we had more time to relax in the comfortable accommodations. The location was pretty good for getting around the city. It wasn't much to look at, but close to the metro and some restaurants. Leo (at check in) was very pleasant and helpful. The apartment was spacious, as many places in the city were very small. The position is just what you need. Close to two metro lines and to place espanya makes everything so easy to reach and trust me in the evening you will appreciate when the home is close from metro after the long walks. The kitchen. Seriously. You may have a different diet, or if you get there with a kid having a kitchen where you can make the breakfast or dinner is a dream. Location is great, close to metro and shopping centre. The apartment was comfortable. Staff were friendly and helpful. The apartment was clean, furniture basic, kitchen was well-equipped with cooking utensils, crockery. Bed was good, not too hard or soft. Shower had hot water. Apartment decor very plain possibly giving a poor first impression. No coffee, tea or sugar provided (which is common in low budget hotels it seems). Location for access to train staion is excellent, hotel is in a quiet street which could be an issue if guests are nervous of walking around at night. Lock in a great price for The Urban Suites – rated 8.7 by recent guests! The Urban Suites is located just 1,000 feet from Sants Train Station, in a commercial district of Barcelona. This modern air-conditioned apartment complex offers spacious accommodations with free WiFi access. 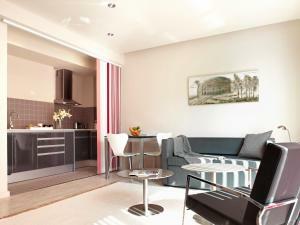 The complex has stylish apartments, with minimalist design. They all offer an private bathroom and well-equipped kitchen. Both the living area and bedroom have LCD TV with satellite channels. You can make use of a communal laundry room. Urban Suites are a short walk from the Fira Exhibition Center. Montjuïc Hill is also nearby. Attractions include the Olympic stadium, the Catalan National Gallery and the Magic Fountain. The apartments are well-placed for transport connections, only 3 stops from Camp Nou. Plaça Espanya Metro Station is 1,000 feet away. Direct airport buses also stop in the square. When would you like to stay at The Urban Suites? These bright and spacious apartment have 1 double or twin bedroom and a full bathroom. The open-plan kitchen/living room with a sofa bed is separated from the bedroom by 2 sliding doors. It has free Wi-Fi. Some of these apartments are suitable for guests with reduced mobility. 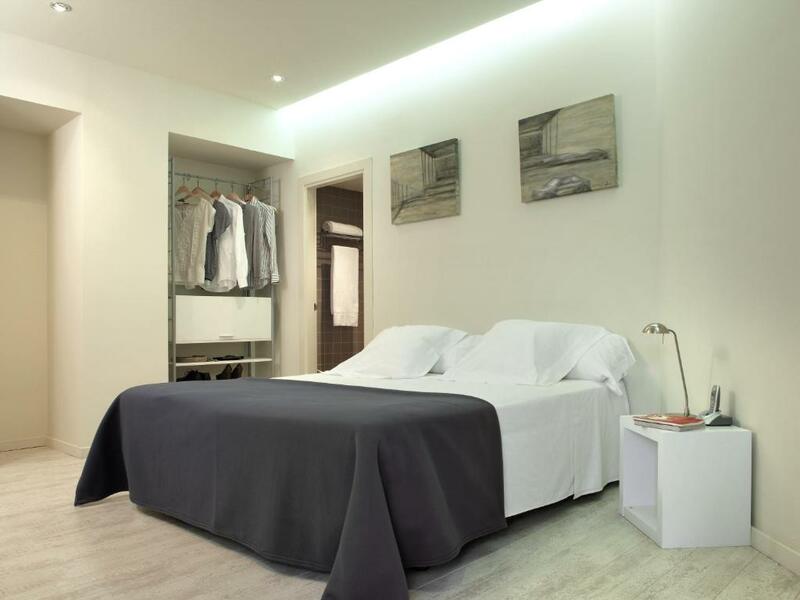 These bright and spacious apartments have 1 double or twin bedroom and a full bathroom. The open-plan kitchen/living room with a double sofa bed is separated from the bedroom by 2 sliding doors. It has free Wi-Fi. This stylish apartment has minimalist design and offers an private bathroom and well-equipped kitchen. There are 2 twin bedrooms and a sofa bed. There is an LCD TV with satellite channels. It has free Wi-Fi. These bright and spacious apartments have 1 double or twin bedroom and a full bathroom. The open-plan kitchen/living room with a sofa bed is separated from the bedroom by 2 sliding doors. It has free Wi-Fi. This stylish, air-conditioned apartment features a flat-screen TV and a private terrace. The kitchen includes a minibar and a coffee maker. There are 2 bathrooms, one of them in the bedroom. New building created and designed for total customer satisfaction, where you feel at home. If something sets us apart is that we are people serving people where our concern is to offer our best to make your stay perfect. We are a family company with over 20 years experience in the hotel industry. After many years working for other companies we decided to realize our dream by offering a modern, contemporary and familiar product which provide personalized service . Area Info – This neighborhood is a great choice for travelers interested in monuments, sightseeing and city trips – Check location Great location - show map Guests loved walking around the neighborhood! House Rules The Urban Suites takes special requests – add in the next step! The Urban Suites accepts these cards and reserves the right to temporarily hold an amount prior to arrival. From 22:00 to 23:30: EUR 35. Please note that for nonrefundable bookings, the credit card used to make the booking must be presented upon check-in. If the cardholder is not the lead guest, please contact the property in advance. Please inform The Urban Suites of your expected arrival time in advance. You can use the Special Requests box when booking, or contact the property directly using the contact details in your confirmation. A little overpriced when compared with similar properties that are more modern. I like to have a coffee or tea without having to leave the room to go to a vending machine on another floor. This place is like a bad joke. It is very noisy: the ventilation, the lights (you can even hear when the guest above turn on the lights in their room), the coming and going. The cleanness of the room, towels, coach is also to be improved. I won’t come back, for sure. We appreciated owner`s attitude, always helpful. The location is a very good starting point to experience the city , near to metro ,bus and train station. Easy access to the apartment , quiet neighborhood. Nice weather , temperature fluctuations were within 2-3 deg C throughout the day and night. Not enough comfy chairs. 1 bed settee and 1 Chair. Not enough for 4 people to sit down. Prob could have got another chair if asked. Staff very helpful. Security was very good. Very quiet, did not hear noise from other apartments. Well designed space, comfortable. Helpful, friendly receptionists, on hand . Liked the info book. Laundry equipment. 1. No cloth washing machine was provided inside the room. 1. The department location is very well, 1 minute walking to the green line (line 3) metro station, and 3-5 minutes to the line 1 metro station. 2. The reception staffs are very helpful. 3. The room facilities are met routine requirement, no washing machine. 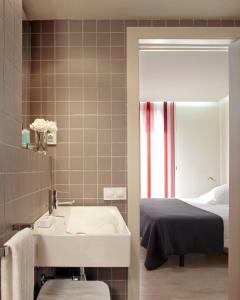 location, clean, comfortable bed, good pressure of hot water in shower, plenty of towels.